Where to grab some food on Thanksgiving if you aren’t doing the cooking thing this year. Our initial review of Locanda Verde came shortly after the restaurant opened in 2009, back when we were brand spanking new and writing like drunk four-year-olds, and back when Andrew Carmellini was considered an “up and coming New York chef.” Time seems to have been good to both parties, in that we are now almost spelling at a sixth grade level, and Locanda Verde has become a permanent fixture of the New York restaurant scene. It had been a long time since we’d actually eaten in this restaurant, thanks mostly to the fact that reservations are nearly impossible to secure. We finally managed to make our way in a few times in the last month or so and decided a review refresher was in order. Five years in restaurant terms is essentially a geologic period. And yes, that’s a dinosaur reference. After our recent visits, two things seem apparent: Locanda Verde is at least as good, if not slightly better than it was back in 2009, and it’s also still a serious scene. The food is consistent and generally excellent, and this is still one of the best celebrity sightings destinations in all of New York. The only downside is that along with that scene comes a pretty uncomfortable environment at times. Between the bar and the dining room, a lot of people get crammed into this space. And if you are a party of two, chances are good that you will end up dining at a very small table, in very close proximity to someone who will likely be wearing crocodile somewhere on their person. If you can live with all of that, and you can actually manage to get yourself in, then Locanda Verde should be near the top your the list when it comes to the best restaurants in this town. We’re certainly going to try and make our way back sometime in the next five years. Just imagine how good we’ll be writing then. A Locanda Verde classic that absolutely must be on your table. This is a very simple but incredible ricotta that comes with grilled bread and is drizzled with a delicious olive oil and sea salt. You’ll be eating this throughout your entire meal. Another Locanda Verde superstar item that you need to be eating. These little meatball sliders with goat cheese make all other sliders pale in comparison, and maybe all other meatballs, too. Order them. We could probably eat a meal entirely consisting of just these. Each little piece of toast is piled high with crab, jalapeño, and tomato, which makes for a spicy and excellent few bites of food. More from the canon. There’s usually some kind of green pasta on the menu here, and it’s usually really good. In this instance, the strozzapreti (sort of like cavatelli) are served with a “white duck ragu,” pancetta, and chestnuts. In related news, this will probably not make you skinnier. A simple and satisfying ravioli. These are dense, which some people like and some people don’t. We enjoyed them. An excellent salad with apple, fennel, and almonds. This will do a good job of representing your table in the “greens that haven’t been cooked in some kind of fat” category. One of our favorite times to hit Locanda Verde is lunch, specifically because they make some pretty damn good sandwiches. This one, with lamb, pickled peppers, and spicy yogurt on ciabatta is our favorite. This is an occasionally available and always advisable menu item. If you’re cool with dropping some dime (probably about $100), this thing is worth every penny. Even if your server doesn’t mention it, ask them if they have it. You won’t regret it. Belle Reve is a sort of bar/gastropub that’s known to turn into a full on party from time to time. The food is good, but the partying is better. 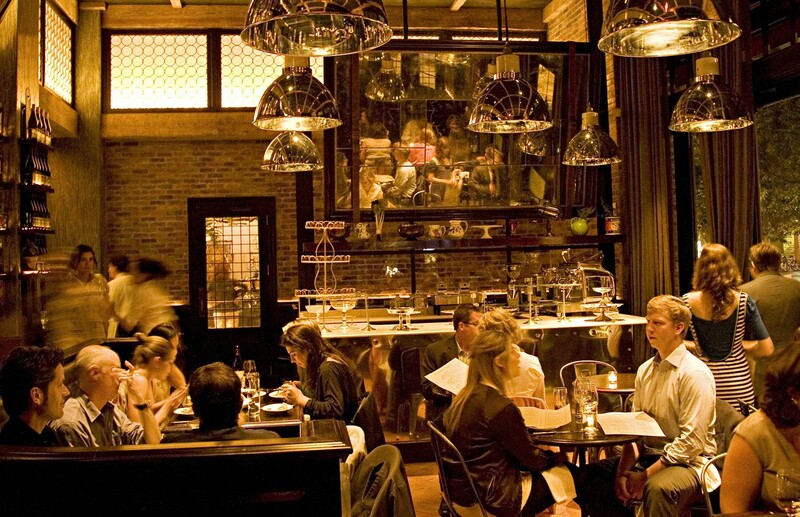 Bar Primi is a great East Village move for a pasta-heavy group dinner.